Well, I've tried to link this easy little craft back to the original picture that I saw on pinterest with NO LUCK! Anyway, someone out there is a genius for coming up with this great idea! I used fabrics with Christmas prints, figuring Indee could wear it as she wished around the house and as a dress up. She came down the stairs from her nap just as I was finishing it. She tried it on to make sure it fit, and decided she didn't want to take it off! Meanwhile I had to run upstairs because Quinn Had just woken from her nap also! I was feeding her, when I heard Indee clunking around downstairs. 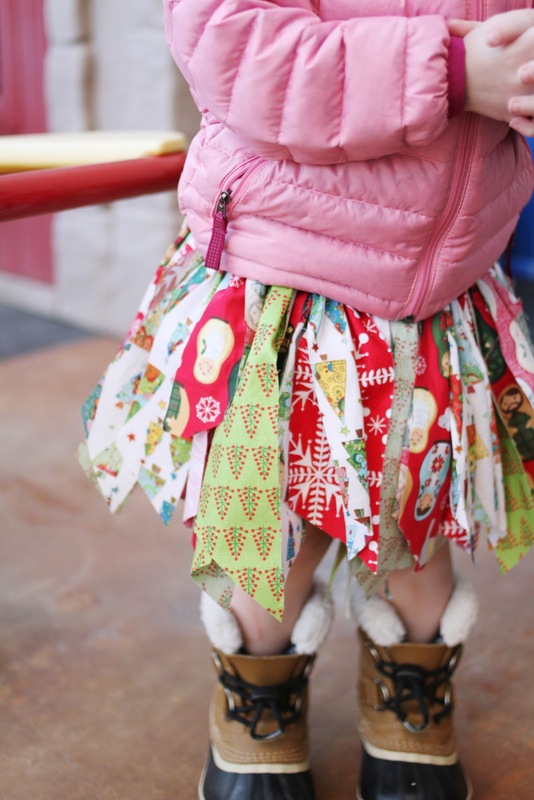 When I went back down she had put her snow boots on with her new skirt and was ready to go outside and play. All I did was measure a length of 3/4" elastic around her waist. Sewed the two ends together. 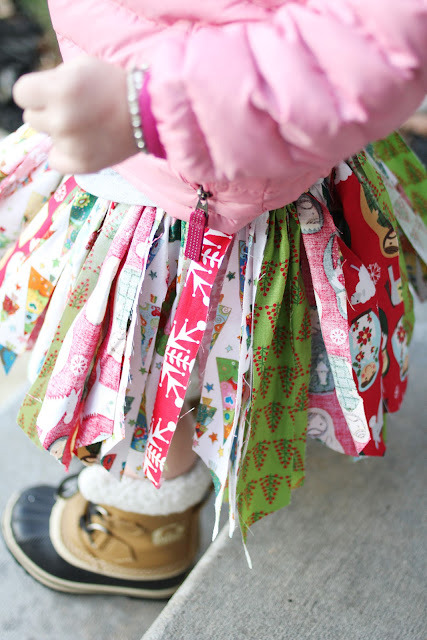 Cut fabric into long strips, making sure that half the length of those strips was the length I wanted the skirt to be. Then I folded a strip in half and brought the looped end around the elastic and brought the two loose ends through the loop, creating a knot around the elastic! 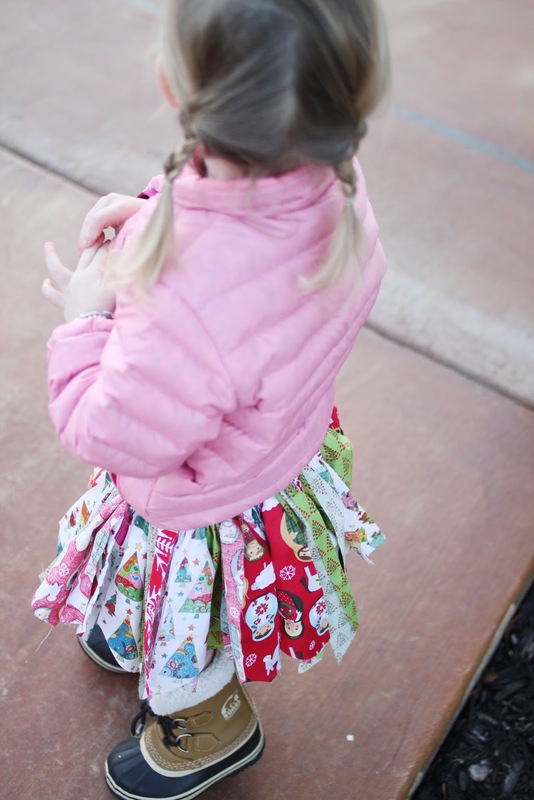 I used roughly 40 strips to make this skirt. Love the outfit combo! I can't believe how big she is Kar! That is beyond cute! 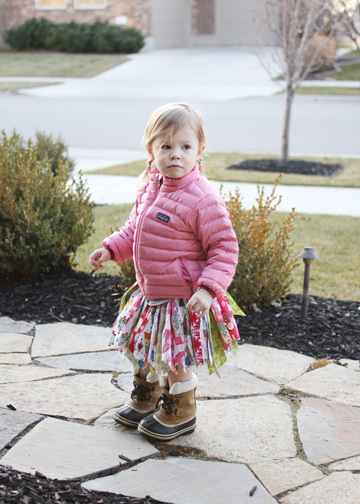 I especially love it with her adorable pink coat and boots - she is the best!